We had flat 3 for one week, did not use the pool other than to sit around. The pictures don\'t go it justice. Place was spotless. Everything worked, UK plugs, could go on, Huge rooms. Have stayed in 5 star hotels a lot less well presented. Somebdy has got the better of Maltese plumbing, never been able to get three showers one after each other and have hot water for all . We had four and still it was going. Made very welcome, felt we could have asked for anything, didn\'t need to because it was all there. Totally recommend this place to anybody. 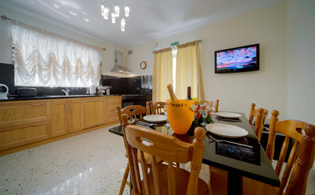 \"I recently traveled to Malta with 9 other friends and we rented out the entire second floor of Ringway Villa. As far as amenities go, the villa was spotless, with spacious rooms, gorgeous bathrooms and an outdoor picnic table that can fit a large number of people. Since we went during a chillier time, the villa tended to easily attract the cold but cards can be purchased to run the heaters in each bedroom. The villa also has a great location! It is right down the street from a major grocery store and the bus station, which takes you to other parts of the island. It\'s also located up on a hill, giving you gorgeous views of Mellieha and a nice 15-minute walk down to the water. Antoinette was very helpful with arranging everything prior to our arrival and continued to be helpful during our stay. I definitely recommend it as a great, low key place to relax with friends or family.\"
\"We were a group of 12 adults in Malta for a family wedding. We took over the whole of Ringway Villa, which was an ideal base for us. The apartments were all very well equipped and beautifully clean. Although it was the end of October, the pool was still in use and though the water was a little on the cold side, a number of us swam several times during the week. Antoinette was extremely helpful and did all she could to make our stay as enjoyable as possible. We hired a car through her, which worked out very well, though it is a short walk from the villa to the nearest bus stop and some of our party made good use of the bus service. So you could easily get by without a car - it was a 20 euro taxi ride from the airport to the villa. Mellieha Bay is 15-20 minute walk (i.e. 15 there and 20 back as it\'s uphill!) from the villa and is very pleasant. I\'d certainly recommend Ringway Villa, particularly for large family groups.\"
Doing a language trip with a group of 14 German pupils aged 13 to 19 we stayed in the Ringway Villa in Mellieha. As we rented the whole villa with its three appartments there was plenty of room for everybody. 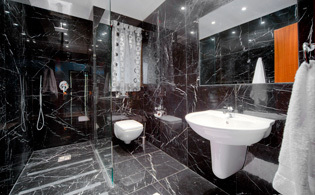 With five bathrooms there were no problems with so many persons getting ready on time in the mornings. The appartments on the upper floor were connected but could easily be separated by closing the doors if you needed more privacy.The rooms were large and comfortable. The kitchens were fitted with all kind of equipment you need for so many persons having breakfast , lunch or dinner together.There was nothing missing.Just a few minutes walk away there is a shop in which you can get everything for your self-catering and the baker��s offer a large varity of tasty and fresh bread and cake and rolls every morning. The villa is located in a nice area , the neighbours are friendly . I used to talk to them in the early morning while having a cup of tea on one of the terraces surrounding the villa. Flowers, plants, palms and lemon trees create a mediterranian atmosphere in the garden and around the pool. The pool is fatastic. The pupils liked to swim and play in the water or just relax reading a book or sleeping in the sun. The villa was very clean and well furnitured . The owner was friendly and helpful. She told us everything we wanted to know about the places to visit, which busses to take best, where to go in the evenings and so on. She was available 24 hours a day.She also organized the transfer from the airport to the villa and back and there weren`t any problems although we had to leave very early in the morning . When we arrived some bread,cornflakes, milk, tea ,coffee, sugar and marmalade were placed on the kitchen tables so that we needn`t go shopping at once.The villa is ideal for larger groups or families spending their holidays together . The beach is nice , there are shops and restaurants and pubs and the public transport takes you around Malta for little money.There is plenty to do. We did a boat trip around the islands of Malta, Gozo and Comino and visited the Blue Lagoon, where we could swim and dive. A speed boat took us to the caves. We visited some cathedrals and churches and the old capital Mdina, where we were taken around in coaches pulled by trotting horses.A visit to Valetta is a must and a harbour cruise is exciting, too.\"
\"8 in our party aged from 81 down to 8 months and Flat 3, Ringway Villa, suited us admirably - plenty of room; all the equipment we needed for the baby; no steps for the 81 year old. The kitchen was extremely well equipped and it was good to have 2 bathrooms. We chose this villa because of its close proximity to the beach for diving. The 2 divers in our party were very impressed with the diving. The villa owner provided an excellent service; arranged for us to be met at the airport and booked a hire car for us. She lived close by and was always willing to provide advice and help with anything. 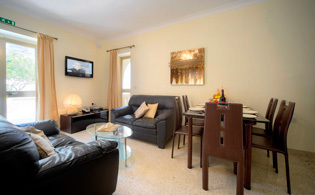 Our first time in Malta and we would definitely recommend Ringway Villa to anyone.\"
\"We stayed here at the beggining of September 2009 and I must say it was amazing. 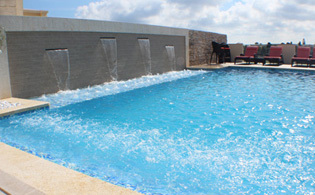 A large spacious villa with it\'s own private pool and BBQ area, plenty of room for 8 to not get on top of one another. Clean, tidy and no problem was too much trouble for the owners to resolve. They even ordered our taxi\'s for us and have a restaurant nearby which served lovely food. 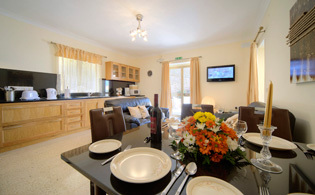 \"we hired the ringway villa for two weeks in July for our family of our two sons and their families. We found the villa an excellant choice and the flats had everything you needed. The swimming pool was just the right size for us with a family of ages of 1yrs to 75yrs. The flat was well furnished and comfortable though some dated but mostly modern. The upstairs flats were very good for little ones, as had a large veranda for them to run around.Antoinette and her husband couldn\'t have been more helpful even when we needed cooking instructions translated. The villa was within walking distant to local shops, we used the bakery daily for fresh bread and cakes and found the supermarket good value. You do have to walk up the the hill a bit though to get to them but at least down on the way back. 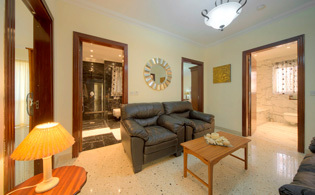 A good villa for a big family group to hire. All our family had a brill time and would go back again. Sue and Trevor and family\"
This villa is exceptionally clean and well maintained. It is beautifully appointed with every facility. The owners provided excellent service and were very friendly and welcoming - nothing was too much trouble. We loved the pool and the interesting views. The comfortable loggia provides welcoming shade. It is well situated for visiting the island attractions although a car is probably necessary.